Loop braiding is a way to make beautiful cords and bands, using only your hands and some yarn or string. It tends to be much faster than knotting or fingerweaving. It has a long, worldwide history, going back thousands of years, some of which has been preserved in manuscripts from medieval and later periods, in both England and Japan. Loop braiding is fun, easy to learn, and is a great addition to any craftperson’s bag of tricks. Check out my list of tutorials (tab at top of screen) and come back for more, I add to the list frequently. Please comment under any of the posts! I’d love to hear about your textile/ crafts interests, talk braids, or just say hi. You can read more about about loop braiding, and about me, under my “about” tabs in the top menu. The other tabs lead to my home page, tutorials, color-pattern instructions, and loop braiding history. My sidebar has more information, including a list of links to other braiding websites, and a list of links to various other textile sites. If you’re curious about the braids in my header photo, there is info about each of them in the comment field below. December 27, 2010 in Loop Braiding. #15, what I lazily call the Spiral Braid is on p. 63 of Speiser’s Old English Pattern Books for Loop Braiding (IIC 1 “A lace bend of 8 bows, one fellow, 2 colors”). #16–A 7-loop square braid is just like the 5-loop square/or round braid, but with 2 more loops. My tutorials cover many more braids than shown in the header photo, and include braids #10, 14, 15, 16 below. I haven’t made tutorials for the other braids in the header photo, but there are links below to any online sources I know of. 1. double-tubular (‘couvert’) braid in plain/ tabby weave, thicker cotton yarn, probably 15 loops. Double-tubular braids have an inner braided tube surrounded by an outer braided tube. The inner and outer tubes are braided simultaneously – one formed by the upper shanks of all the loops; the other formed by the lower shanks of all the loops. If you use bicolor loops, the two braided tubes can be of different colors, in which case you can turn the loops whenever you want to switch the inner and outer colors. In the leftmost braid, one braided tube is black and white and the other is reds and oranges. I learned how to make double-tubular twill braids from Masako Kinoshita’s description on her L-MBRIC site—see #2 here. Later I applied that tube-within-a-tube idea to these plain-weave braids that I make with my own “too-many-loops” method. Double-tubular braids are covered in much technical detail in OEPBforLB. Here’s a link to Cindy Myers’ online directions for one double-tubuler braid (note: she calls them couvert/ couerte braids, which is what they were called in old loop braiding manuscripts). Her index includes directions for many of these braids. All or most of them require two people braiding together. 2. plain weave, braided as a doubleweave that opens to be flat. I came up with the plain-weave loop braiding method for these “too-many-loops” braids on my own (braids 1-4, 9, 12, 13). (It may not be the most efficient method!) 15 loops. 3. double-tubular, plain weave, 16 loops (see #1). Here, one of the tubes is black and white, the other green and pink. 5. like #8, katheren wheele, but without the openwork. Flat, 15-loop braid. Traditionally would have been made by 3 braiders co-operating. Although this braid may not be notated in the old loop braiding manuscripts(? ), it would have been quite obvious and likely a prerequisite braid for any braider familiar with the Katheren Wheele braid. (This is one of many braids not specifically notated in those manuscripts, but which can logically be inferred to have been well-known at the time the manuscripts were written). 7. Double Grene Dorge (double Barleycorn) braid , 15th C. 12 loops. See fingerloop.org’s instructions (for two braiders working in co-operation on one braid). 8. Katheren Wheel, 15th C. 15 loops. This was traditionally made by three braiders working together side-by-side and exchanging loops to connect their braids. Each braider does the moves of a 5-loop braid–two consistently making “divided” square braid moves, and a braider on one end consistently making “flat” square braid moves, just as in braid #5. The lacy “holes” occur when 2 of the braiders stop connecting their braids for a few cycles in a row. The modern instructions on fingerloop.org for this 3-person braid have some problems. Main one: when three braiders cooperate in making a braid, none should mirror the others’ moves the way two braiders do in making double braids. All 3 braiders should first make a left transfer, then a right one (or vice versa). If one of the braiders does this in the opposite order from the other two, it creates a glitch that a bit later the braiders will have to do some extra work to fudge over. 9. plain weave flat,like #2 , thicker cotton yarn. 15 loops. Original method. 10. Lace Dawns, 15th C. 8 loops (wool) Link goes to my tutorial for this braid, which teaches my “thumbs” method for making this braid with fewer moves than the traditional method. Click here for Cindy Myers’ description of the traditional method. 11. Original method, Unorthodox braid (a type of braid where the taken loop only goes through some of the loops—goes over and/or under the others). 11 loops. 15. Spiral braid, called “lace bend round” in the 15th C. (a ‘lace’ meant a ‘braid’ then, as in “shoelace”). Variegated silk yarn and thinner purple linen. 8 loops. Most of the braids are embroidery floss and or 5/2 perle but a few are thicker cotton or other fibers. I made all of them solo, including the ones that traditionally would have been made by two or more co-operating braiders. All my loop braiding tutorials are listed here, in a more organized manner (easiest first), including many braids not shown in the header photo. The most complete reference and how-to for traditional braids, and for loop braiding in general, is Noémi Speiser’s Old English Pattern Books for Loop Braiding, 2000. E. Benns and G.Barrett’s Tak V Bowes, Departed also teaches many traditional loop braids, has color photo illustrations, and may be easier to follow. BraidersHand is a U.S. distributor of both books. update: both books are now out-of-print. This blog is (so far) the main source that teaches the V-fell method for braiding simple loop braids, long practiced in many parts of the world outside Europe. It’s also the only source for my methods of making multi-loop braids as a solo braider. 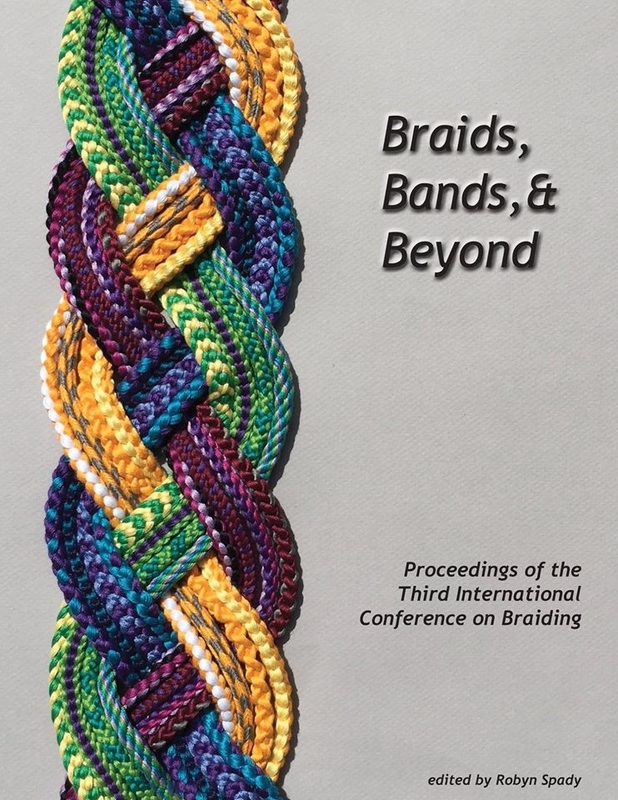 No longer completely true—the 2012 International Braids Conference proceedings book Strings that Move (see top of my sidebar) includes a how-to article on my solo-braider methods for making all twelve or so of the possible shape variations of double braids. Wow, Ingrid, the letterbraid is gorgeous! It’s perfect for the theme. Do they send it back to you or is it gone forever? Thanks! No, they’ll send it back next year. The traveling exhibition changes every year. That’s assuming it doesn’t arrive too late for their deadline, I probably should have sent it off right away without taking the time to wash it.